This is something I’ve been sitting on for awhile. 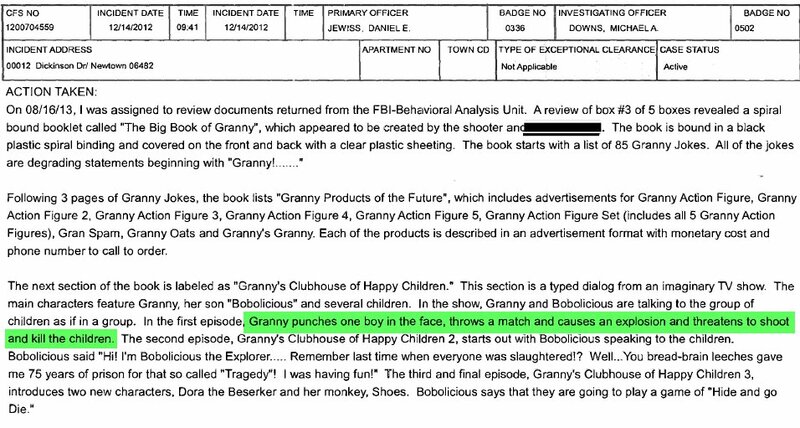 I just wasn’t sure it was worth posting about before, seeing it as more of an odd bit of trivia about the case than anything else, but today’s release of the official report from Connecticut’s Office of the Child Advocate has cast a new level of scrutiny on Adam Lanza’s childhood project “The Big Book of Granny” that he assembled with another, yet-unnamed boy while they were in 5th Grade. So, I’m going to share what they left out: Adam Lanza himself posted an illustration from the Big Book of Granny online. This will take a bit of explaining. 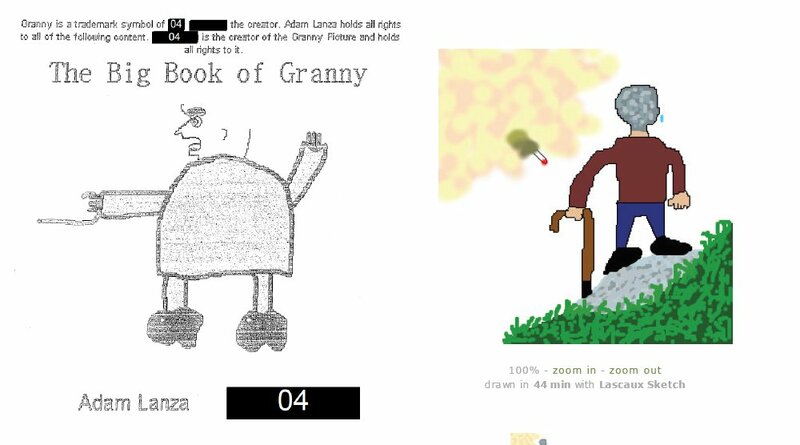 …note that while Adam Lanza’s name is unredacted, the “creator of the Granny Picture” is redacted. So, Adam apparently didn’t draw this picture. That will be relevant. Personally, I’ve never really been interested in this home-made comic book as an investigative lead. Adam would have been in fifth grade at the time, and although the summary of the book provided by police includes a great deal of violence, that didn’t strike me as peculiar for boys in that age group. So apparently, the Big Book of Granny was much, much more disturbing that whatever I was picturing. Now, we need to jump around in time a bit. I had posted that drawing before most of the major breaks in the case took place: just a day after the official report was ever released, before I found the “Smiggles” account, before the radio call was unearthed… basically when Adam Lanza was still a blank slate. And that’s how it stood. Two drawings that look pretty similar, drawn about 3 years apart. Not a big deal really. There are a few issues with this assertion, but I think they actually make this posting more significant. 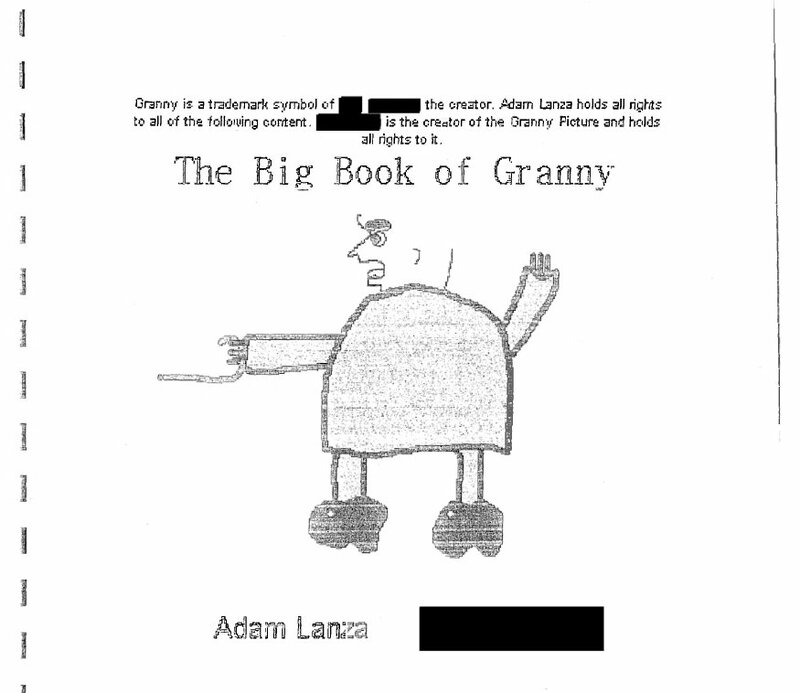 First, as I noted above, Adam Lanza didn’t actually draw the “Big Book of Granny” cover. The other boy (who the Child Advocate report notes is now living in mental health facility) drew it, and confirmed so in interviews with police. While this may not be the most reliable account (given the passage of time mostly, but also due to the co-author’s mental state) the cover of the book records the same, so it’s probably true. If that’s the case, though, that means that Adam Lanza was sufficiently impressed (or obsessed, or interested, or whatever his emotions were) with the drawings that he wanted to duplicate them and pass them off as his own, at least in an online, anonymous situation, three years later. Which brings us to the second point: the “Elder Crying Over a Nuclear Weapon” drawing is not literally a drawing from the Big Book of Granny. It’s a hand-drawn recreation, which actually shows a much more significant level of interest in the Big Book of Granny by its co-author, three years after it was originally drawn. 2draw (from what I can tell, not to mention the name of the site) is not a place where you can cut-and-paste art. You have to draw it in-browser (comparable to something like the app Draw Something.) The 2draw post itself notes that he took 44 minutes to put it together. In other words, Adam was still obsessing over the violence in his (5th grade) book by the time he was almost an 8th grader. And I think that’s far more significant that quibbling over whether the original drawing was by someone else, or differed from the 2draw post. That he wanted to recreate it after so long, and put so much care into doing it, speaks to a deeper issue. The next section of the book is labeled as “Granny’s Clubhouse of Happy Children.” This section is a typed dialog from an imaginary TV show. The main characters feature Granny, her son “Bobolicious” and several children. In the show. Granny and Bobolicious are talking to the group of children as if in a group. In the first episode. Granny punches one boy in the face, throws a match and causes an explosion and threatens to shoot and kill the children. The next section of the book is labeled “Adventures of Granny.” There are eight chapters labeled “The Adventures of Granny” through “The Adventures of Granny 8.” All eight chapters are dialog between Granny and another character identified as Granny’s Son with various persons added in. In the first chapter, Granny and Granny’s Son rob a bank, Granny shoots people with her rifle cane, and then blows up the bank with dynamite. After the robbery. Granny’s Son shoots Granny in the head with a shotgun. In the second chapter. Granny and Granny’s Son go on a boat ride. Granny falls out of the boat and Granny’s Son throws her a cement floatation device which forces her to sink to the bottom of the ocean. In the third chapter. Granny and Granny’s Son try to capture a boy and stuff him, to put on the mantle. 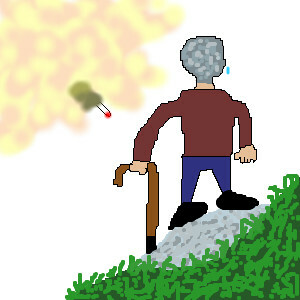 Granny kicks the boy into the fireplace and he begins to burn. The boy jumps out of the fire and Granny punches him in the face. Then Granny shoots at him three times with her rifle cane and misses him. Granny then throws a Granny Action Figure to the boy. The boy gets distracted and the action figure comes alive and shoots the boy. Granny’s Son says “Yay! Now we can hang it!” In chapter four. Granny and Granny’s Son go to a hockey game. Granny goes onto the ice and punches one of the players and then shoots him with her rifle cane. After the hockey game, Granny and Granny’s Son go to Duchess restaurant to eat. In chapter five, Granny goes to Marine boot camp and meets up with Dora the Beserker and Swiper the Rackoon. Granny asks Dora if she would assassinate a soldier at midnight and Dora agrees to do it. Dora says ” I like hurting people…Especially children…” Granny then shoots multiple people with her rifle cane. This case remains ACTIVE pending further investigation. This entry was posted in Uncategorized and tagged adam lanza, big book of granny, granny, office of the child's advocate, sandy hook. Bookmark the permalink.